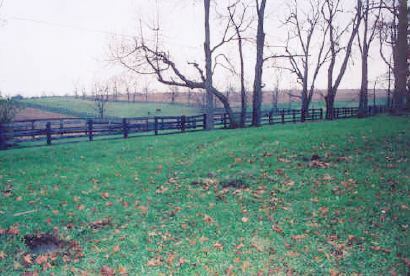 HARTLAND STUD, at Versailles, Kentucky, was established on acreage granted to Virginia settler William Preston in the eighteenth century, who passed it on to his son-in-law Nathan Hart. In 1888 the property was purchased by Johnson N. Camden (later a U.S. senator), who made his money in railroads, trolleys, coal mines and banks, and was a founding member of the Kentucky State Racing Commission and a president of the Kentucky Jockey Club. He began his bloodstock breeding operation with the stallion Spendthrift, purchased from James R. Keene in partnership with Overton and Christopher Chenault under the name Spendthrift Stud; the partnership was dissolved in 1892 and Spendthrift was moved to Chenault's Spendthrift Stud. Camden also purchased imported ESHER (1883-1901), a big, handsome horse and a successful sire of such runners as Suburban winner Alcedo and the speedster Moharib. Over the years, Hartland Stud stood a number of notable stallions, including the great runner and one-time leading sire BEN BRUSH (1893-1918), the big fast sprinter PETER QUINCE (1905-1930), the good three-year-old English-bred runner and successful American stallion LIGHT BRIGADE (1910), and English-bred winner CRAIGANGOWER (1919). Light Brigade and Craigangower were both later sold during the depression-forced dispersal of Hartland Stud bloodstock in 1931, as were the speedy mare Miss Joy (by Peter Quince) and many of Light Brigade's daughters, such as Oh Susanna!, Atalanta, Dark Phantom, and Flattery, but ROSE OF SHARON (1926, by Light Brigade), "queen of the three-year-old fillies," who won ten of her 14 starts and was unplaced once, was laid to rest here when she died of pneumonia following her win in the Potomac Handicap. Her dam, ROSA MUNDI (1911-1930) is also buried here. Another horse bred at Hartland was American Derby winner Hydromel (by Light Brigade). The graves were located by the farm's stallion barn, now razed, and today only a dead tree and their gravestones marks their location. Camden married a second time in 1930 and through his marriage was connected with Runnymede Farm, where he lived with his second wife. In 1933 Hartland was sold to Silas Mason, who had previously bought Hereford Farm, three miles north of Hartland; the combined properties totaled 3,000 acres. Later it passed into the hands of the Abercrombie family and operated as Pin Oak Stud. The site is now a private residence owned by the University of Kentucky.--P.E.